He gave her a 7.25-carat solitaire ring! 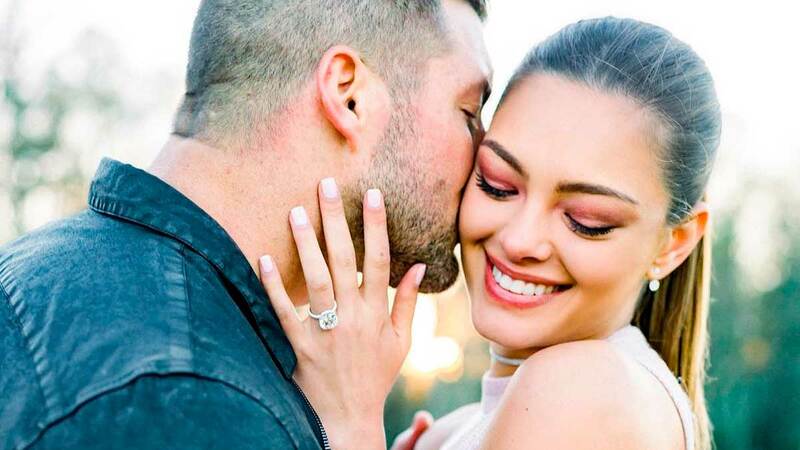 This is not a drill: South African model, beauty queen, and Miss Universe 2017 Demi-Leigh Nel-Peters just got engaged to professional athlete Tim Tebow! In an Instagram post, Demi-Leigh shared photos of the exact moment Tim proposed to her, saying, "Any dreams I've ever had, you've exceeded them all! I love you and I can't wait to spend forever with you!" We are so in love with his sunset proposal! According to People, Tim flew in Demi-Leigh's friends and family to Florida to witness the special moment. The proposal featured a customized bench engraved with the date when they first met (CUTE!) and South African singer Matthew Mole was there to serenade them with his rendition of "The Wedding Song," one of the couple's favorite tracks. Demi-Leigh (23) and Tim (31) first confirmed that they were dating in July 2018, and since then they've spent Thanksgiving together and went on a trip to South Africa to visit Demi-Leigh's parents. Here's a fun fact: Tim's parents are missionaries and he was actually born here in the PH! He also does a ton of charity work, is a former professional American football quarterback, and currently plays professional baseball for the New York Mets. P.S. Totally unrelated, but Tim used to date model and Miss Universe 2012 Olivia Culpo and Brazilian-American actress Camilla Belle.